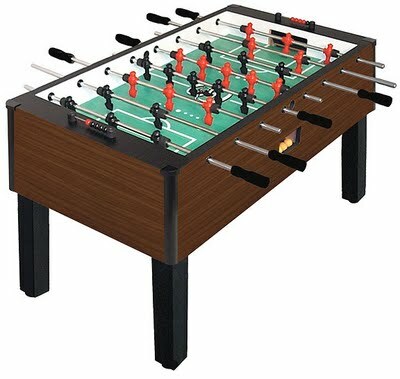 The Shelti Adversary is a high-quality American style foosball table for those players looking to get something different than a Tornado. 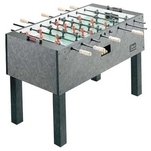 Though both brands offer similar play styles, the Shelti has a slightly different European-style ball control with a wider foosball man toe. It has many features we like to see when reviewing a table including counterbalanced men on chrome-plated rods, side ball returns, and adjustable leg levelers. The Adversary only has 1 inch thick cabinet MDF walls, which we prefer 1 1/2 inch thick walls for greater stability and resists chipping. Bring a Shelti Adversary home and you will have a truly competition-capable table. However, Tornado tables are the tables used by the pros and the tables you will find at tournaments in the United States. Double-wound spirol pins lock men & handles to rods — No "slop."